This is weird, but I’m just going to say it: I woke up a couple of days ago thinking about cornucopias. I don’t know why, but there it is. I laid there, trying to imagine a way I could make one out of fabric. There’s only one way to get something like that out of my head, so here’s how I did it. Print this pattern. It fits on regular 8 1/2 by 11” paper. Cut out one from cotton fabric for the outside, one for the inside, one from quilt batting and one from muslin or other “throwaway” fabric (you won’t see it). You should have a total of 4 pieces of this odd shape. Layer muslin face down, batting over that and outer fabric face up on top. Working from the center, pin like crazy. For a large quilt, I use safety pins, but for something this small, straight pins worked fine. Stitch through all the layers in curved lines as shown on the pattern. Stitch all the way around the outside, very close to the edge. Trim away the excess batting around the edges. Fold it in half, with the muslin to the outside, and stitch around the top and back curves, leaving the front open. Do the same with the lining, leaving a small opening somewhere on the large top curve for turning later. Clip corners. Turn the lining right side out and stuff it inside the outer part. Don’t worry about turning all the way to the point of the tip, because you’re going to turn it back later. 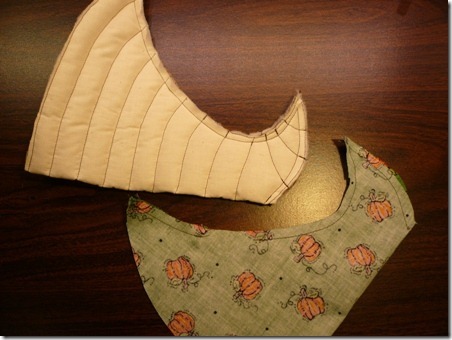 The right side of the lining should be facing what will be the outside of your cornucopia. Pin the opening edges together and stitch. Turn the entire thing through the hole in the lining. Stitch the opening in the lining closed. Push lining into the outside, carefully pushing all the way into the tip. I use a pointy stick. It looks a little like a big pencil with no lead. Topstitch around the open edge to hold the lining in place. I didn’t notice until I took this picture that I have some puckering in the lining where I topstitched. I should probably fix it. Yep, I’ll get right on that. I made the little pumpkin using the tomato pincushion pattern from this post. I used the one that starts as a rectangle, I just made it a little smaller.